Government reforms to ease formal lending to SMEs. We’ll look at each of these four individually, but what you will get out of the numbers is this – Demonetisation has left banks flush with cash, while SMEs previously using informal channels are now starved for cash and paying customers. This creates an unprecedented opportunity to send a flood of struggling SMEs into the fold of banks and other institutional lenders. That’s exactly what Prime Minister Narendra Modi did in his New Year’s Eve address to the nation on television, by announcing a series of measures to help SMEs get easier access to more financing. As per data from the SME Chamber of India, the sector is comprised of 36 million units that employ more than 80 million people. This means that the SME sector is India’s second largest employer, after agriculture. Size notwithstanding, SMEs in India face a huge number of challenges such as government regulations, slow technology adoption, unskilled manpower, global competition and internet retailers. But their single biggest challenge is easy and fast access to finance through formal channels. Loans to eligible small businesses are still primarily provided only by large public-sector banks and NBFCs. 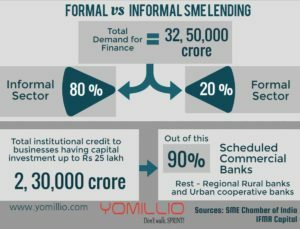 The infographic below clearly shows the lopsided tilt of SMEs in favour of informal lending. A total of around 97% or Rs 14.97 lakh crore of the Rs 15.44 lakh crore in banned high denomination notes has already come into the banking system. This surge in deposits, coupled with withdrawal limits, has left banks flush with cash. As a result, SBI, the country’s largest lender, has announced that they are cutting their Marginal Cost of Funds Based Lending Rate (MCLR) to 8.0% from the previous 8.9%, with effect from Jan 1, 2017. That’s a huge cut of 90 bps (basis points). Other banks are likewise all set to announce reduced interest rates in early 2017. But even the promise of lower home and auto loan interest rates by banks will not by itself shore up consumer lending, and formal SME lending by extension. Demonetisation has stifled consumer spending, with demand for loans at a historic 54-year low. The loan growth rate was at 8% two months ago, but it’s now at 5.8%, the lowest ever growth rate since 1962. 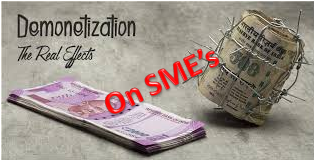 Furthermore, demonetisation has also lead to a spike in defaults from SMEs because their business has suffered, although this is likely to be temporary. Across the board, financial institutions are reporting deterioration in credit quality of their SME portfolio. With their customers unable and/or unwilling to spend until withdrawal limits are eased, the retail and SME sector has followed suit and put projects, loans and funding applications on hold until things get back to normal. Even those who want to apply for loans are finding it difficult because banking staff is too busy with currency note exchanges and withdrawals to deal with anything else. The RBI has stepped in, first with a 100% CRR, and then market stabilisation bonds, to mop up excess liquidity in the banking system. However, normalcy in the formal lending channels is not expected until the withdrawal limits at ATMs and banks are eliminated completely. Yomillio sees the NBFC sector taking the lead in unsecured lending to SMEs in this time of flux. A quick note here about informal lending channels. What is it comprised of? Informal lending includes financial transactions that happen outside financial institutions, and are not regulated by the government, e.g. friends, family, money lenders and loan sharks. Trade credit among businesses for B2B transactions may also count as informal lending, if interest is being charged for delayed payment. Informal lending is relatively small amounts in short-term unsecured loans offered through relationships, social networks and personal or business contacts. 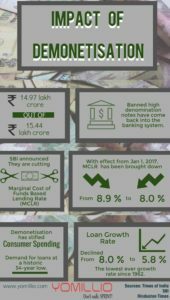 The reason for providing this summary of informal lending is because it makes it easier to understand how demonetisation is enabling a shift from the informal to formal lending channels. Historically, SMEs in India have conducted their transactions mostly in cash, which made income verification very difficult for the lender because there was no electronic trail. With demonetisation cutting off the availability of financing through informal channels, a huge number of SMEs have actually started taking payments digitally, either through POS machines and/or digital wallets. This provides insights into their turnover and other financial aspects, which is very valuable to lenders when taking a credit call. As such, the digital shift caused due to demonetisation will increase credit flow from formal channels to SMEs who have embraced digital modes of payment. Secondly, SMEs have stayed away from digital payments until now due to a culture where it was ok to avoid “taxable income” that would be documented, and a general comfort with cash payments that involve no intermediary charges (MDR). Demonetisation has caused a culture shift, and it seems to be permanent – to the point where even pani puri vendors accept Paytm transfers nowadays! Finally, we arrive at the core issue – which is that the end result hoped for out of all this chaos and hardship is a cashless India. Demonetisation, as long as it lasts, is forcing people and businesses to embrace transactions through the formal banking system. SMEs seeking finance will have to go through the formal lending system if they can’t get cash from customers or their usual informal lenders. It has to be done before the demonetisation curbs end, otherwise SMEs and MSMEs may just go back to doing business as usual – in cash. That’s why Prime Minister Narendra Modi, in his New Year’s Eve address to the nation on television, announced a series of measures that are directly intended to help more SMEs get more credit and bigger loans from banks and through government loan schemes. – Hike of credit guarantee fund for micro units development refinance agency or MUDRA. Government will now provide guarantee of up to Rs. 2 crore, twice the previous threshold of Rs. 1 crore. The scheme will now bear the costs of underwriting funding provided by NBFCs too, when previously it only covered bank loans. – For small enterprises, cash credit has been hiked from 20% to 35%. – Working capital loan for digital transactions hiked from 20% to 30%. Summing up, if demonetisation and these SME lending reforms help move even a small percentage of SMEs from the informal to the formal lending system, all the hardship and the long queues at ATMs may just be worthwhile in the end.